Port Hudson was the site of the longest siege in American history, lasting 48 days, when 7,500 Confederates resisted some 40,000 Union soldiers for almost two months during 1863. Realizing that control of the Mississippi River was a key military objective of the Union, the Confederacy in August 1862, had its forces erect earthworks at Port Hudson. In 1863, Union Major General Nathaniel P. Banks moved against Port Hudson. Three Union divisions came down the Red River to assail Port Hudson from the north, while two others advanced from Baton Rouge and New Orleans to strike from the east and south. By May 22, 1863, 30,000 Union soldiers had isolated 7,500 Confederates behind 4 ½ miles of earthen fortifications. On May 26 Banks issued orders for a simultaneous attack all along the Confederate perimeter the following morning. The first Union assault fell on the Confederate left wing, which guarded the northern approaches to Port Hudson. Timely reinforcements from the center allowed the Confederates to repulse several assaults. The fighting ended on the left wing before the remaining two Union divisions advanced against the Confederate center. Here the Confederates repulsed the Federal advance across Slaughter's Field, killing approximately 2,000 Union soldiers. Union casualties included 600 African-Americans of the First and Third Louisiana Native Guards. Free blacks from New Orleans composed a majority of the First Louisiana Native Guards, including the line officers. Former slaves commanded by white officers composed the Third Louisiana Native Guards. Led by Captain Andre Cailloux, a black officer, the two regiments made their advance on the extreme right of the Union line. Captain Cailloux was shot down as he shouted orders in both French and English. Another attempt to take Port Hudson failed on June 13, when the Confederates inflicted 1,805 casualties on the Union troops while losing fewer than 200. The Confederates held out until they learned of the surrender of Vicksburg. Without its upriver counterpart, Port Hudson, the last Confederate bastion on the Mississippi River, lacked strategic significance and the garrison surrendered on July 9, 1863. Today, the Port Hudson State Commemorative Area encompasses 889 acres of the northern portion of the battlefield, and has three observation towers, six miles of trails, a museum, a picnic area and restrooms. Four thousand Civil War veterans are buried at the Port Hudson National Cemetery, which stands just outside the old Confederate lines. The Port Hudson State Commemorative Area is located at 236 Highway 61, in Jackson. The park is open 9:00am to 5:00pm daily, there is a fee for admission. Groups are requested to call 1-888-677-3400 in advance. 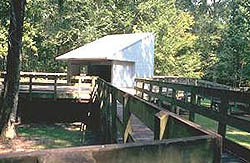 Visit the park's website for further information. The Port Hudson is the subject of an online-lesson plan produced by Teaching with Historic Places, a National Register program that offers classroom-ready lesson plans on properties listed in the National Register. To learn more, visit the Teaching with Historic Places home page.